Today’s equivalent of the ancient wine press outfitted with modern day technologies. 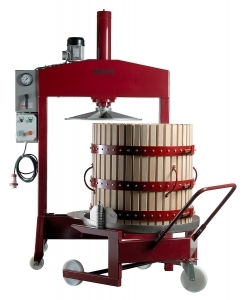 The presses are particularly suited for extracting high quality must from red fermented grapes and delicate wine from destemmed white grapes. 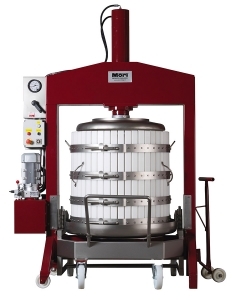 The presses are available in a variety of sizes and configurations. 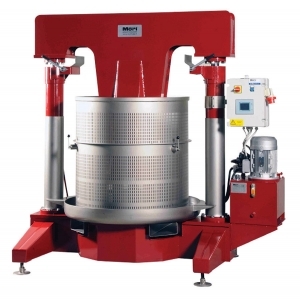 Electric hydraulic presses, includes: one (1) painted steel trolley with S/S tray and auto restart pressure control from 70 to 350 bar – restarting interval 50 bar. Electric hydraulic presses with semi-automatic uncaging system, includes: (1) forklift tray, (1) one-piece, S/S cage, 2-speed hydraulic system (2 pumps), pressing plate completely covered in stainless steel and electric control box with temporizer for automatic controls. Electric hydraulic press with automatic cake discharging system, includes: S/S forkliftable tray and one-piece S/S cage, two-speed hydraulic system (2 pumps), S/S covered pressing plate, PLC control panel, side rams for cage lifting, auto restart pressure control from 80-350 bar. See brochure for sizes, options, load volumes, cages.